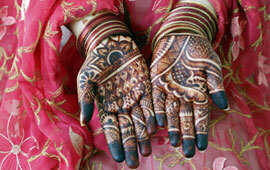 In India, festivals are very numerous and varied due to the diversity of regions. But they are still high in color, full of life and are carried by the music and dances. Festivals in India - A quick list of Festivals in India. Kite Festival, unique in its kind. In the evening, thousands of kites illuminated and fireworks ablaze the sky. Kite festival takes place mainly Jaipur Jodhpur. The Republic Day gives rise to important events. In Delhi, Rajpath with military parade of elephants and camels. 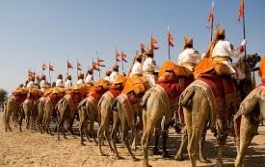 Camel festival in Bikaner, an enchanting city in the middle of the desert comes alive with the sound of music and dance. This is a unique opportunity to see unusual folk performances and camel races. Desert Festival in Jaisalmer, the golden city. One of the most popular. This is a true spectacle that takes place in the middle of sand and leave dazzled even the greatest travelers. Not to be missed. 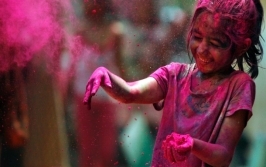 Holi is the most exuberant Hindu festivals. It celebrates the end of winter by throwing water and colored powders. So beautiful and euphoric. Teej festival in Jaipur to celebrate the advent of the monsoon. Essentially feminine, you can admire these women dressed in their finery. Anniversary of Gandhi, the father of the Nation. Jodhpur International Folk Festival. This is the first Indian festival celebrating the music of Rajasthan since its inception. Musicians, singers and dancers flock there from all corners of Rajasthan to give a recital of the most beautiful. Diwali celebrates the return from exile of Rama and the most joyous festival is dedicated to Lakshmi, Kali and Krishna. Several days of festivities and celebrations. Magical and unforgettable. Pushkar festival. The most famous of all the festivals of Rajasthan, Pushkar is an important pilgrimage as well as the site of a huge cattle fair. Bazaars, auctions, music and sports make this event a very special moment for everyone. Highly recommended.